I bought this for my daughter in law as a special gift for her and my son. They love it. This sophisticated dining set brings a vintage feel to both formal and everyday dining rooms. 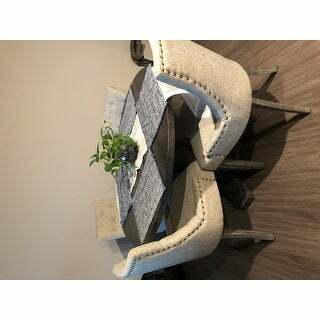 Crafted of solid rubberwood and MDF, the Araine Dining Set designed by Angelo Surmelis features a thick pedestal base table in a rustic weathered grey finish. The natural wood grain creates a beautiful backdrop for your place settings. 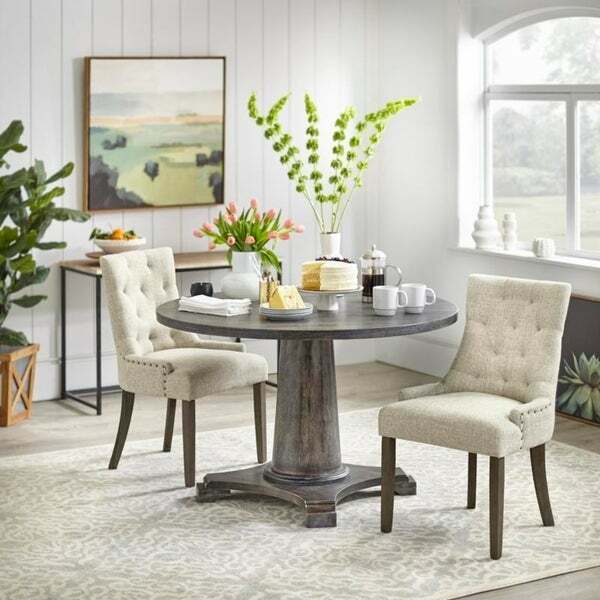 Upholstered in a neutral light grey, textured fabric, the parsons dining chairs are decked out in designer details, including nailhead accents and diamond-tufting on the chair backs. Solid rubberwood legs feature a matching weathered finish. Chairs crafted of rubberwood legs, fabric and foam. We are absolutely in love with this product! The chairs are a perfect size and very comfortable. The cloth is textured, so even if you spill something no one will know! Would definitely recommend this dining set! 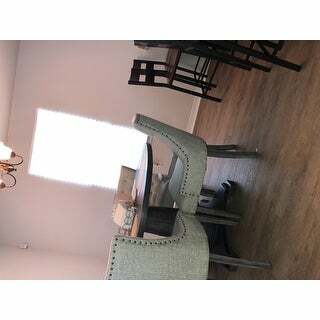 The chairs are easy to put together and they are really comfortable.The table is sturdy,I definitely recommend the dining set it was also quick delivery. Just beautiful.The chairs are a nice tan looking tweed and the legs are destress brown.As for the table it's a dark brown wood. Great mix of materials give this table and chairs a refined rustic chic look. Just what we were looking for at an amazing price. There are some shading variations within the table components. I am so excited to have received and assembled my 5-pc. dining set. It is the perfect size for my new open concept apartment. It coordinates nicely with my white leather living room furniture. The style is eclectic modern. The chairs are uber comfortable! I just love it, and it came just in time for the holidays! We live this dining set. Delivery was prompt. It is so pretty! 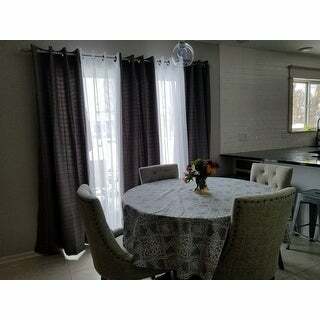 Perfect size for our breakfast area. It was very well packaged and no damages. We love the look! Love, love, love this set! 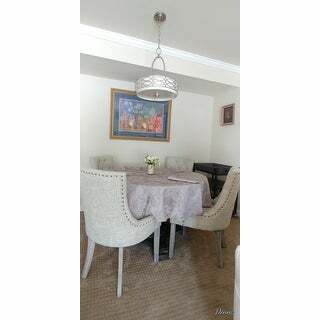 It is big is big enough for my family of 4 and you can comfortably to add two more chairs if you have guests. Chairs are very comfortable. Great buy! I like this piece, just not 100% sole. The color is a little off. It’s more of a light olive green tone. Overall I’ll settle. It’s too much of a hassle to return. Chairs sit horribly, finish on the wood is just okay. "When would this be in stock again? " "When would this be back in stock?" Chosen for the style, value and the size. Rustic Charm and great value! !